When people think of handmade rugs, they might imagine rich heirlooms painstakingly handcrafted by seasoned artisans; the kind of thing you can pass down to future generations. Many people are pleasantly surprised at the wide variety in all price ranges! Handmade rugs have been the hallmark of the floor covering industry for centuries, providing beautiful collectables to families from rug-makers around the world. In this age of factory-produced goods, including machine-woven rugs, has the handmade standard gone out of fashion? Absolutely not! In fact, thanks to modern improvements like Internet shopping, fast international shipping, and exceptional mail order services, we have access to more types of handmade rugs than ever before. You can easily get your hands on classic Persian, Indian and Oriental rugs in a rainbow of styles. There are also plenty of Tibetan and Grecian rugs, European masterpieces, and even funky, hand-knotted contemporary rugs in a range of upbeat and colorful styles. All handcrafted. All collectable. Use Rug Finder to See Rugs in Your Favorite Style, Color or Size! Pick any desired aspect (style, color, material, size). Narrow it down, one option at a time, until you have a rug that's just right for you! To understand what it means for a rug to be handmade rug, let’s take a look at several of the various types of rug-making that have evolved over the years. Hand-tufted is one of the most popular of the handcrafted styles, offering a unique blend of patterning and all-over thick softness. 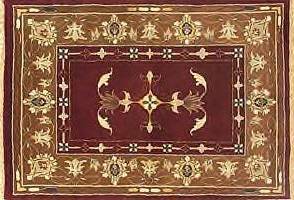 A canvas, or other sturdy backing, is used as the base of the rug. A hooking tool is worked through the backing fabric by the rug artist, which allows them to pull the yarn or fabric through the backing. Then, the loop is cut at the center, allowing the carpet’s surface to be smooth and luxurious. Hand-tufted rugs are available in numerous styles and colors - everything from Tibetan beauties to contemporary casuals. Hand–tufting is hard-wearing and highly desirable for a clean, polished look. 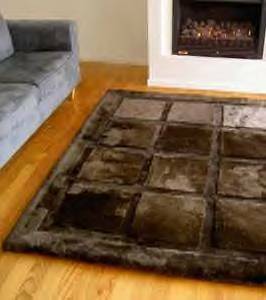 Like hand-tufted rugs, hand-hooked rugs use a similar process of looping. However, once the rug artisan pulls a loop through the backing cloth, he or she leaves it whole, allowing the rug to have a nice “loopy” look and texture. Hand-looped rugs add character and dimension and often come in a variety of solid print colors (although many are also patterned). The loop pile rug is comfortable, rustic, and lends itself well to rooms with wood flooring. Hand-woven rugs are another type of handmade rug. They often call to mind traditional Navajo rug smiths, carefully looming a colorful pattern on an antique wooden loom. An image like that is fairly close to reality. Hand-woven rugs are artfully loomed, by hand, on a traditional loom or a modern loom. The finished product is a sturdy, collectable item that looks right at home in almost any room. And, they’re available in every style imaginable - from Navajo block themes to floral fantasies. One of the reasons that woven rugs are popular is because many of them feature cascading styles and hand-implemented patterns. You’ll also find hand-woven jute, sisal, and bamboo rugs on the market - all created with the deft hand of a skilled rug artisan. The best of all the handmade rugs are the hand-knotted masterpieces. These are the rugs of legend. The rugs that command respect and reverence. Hand knotting is one of the oldest and most refined forms of rug-making, perfected thousands of years ago by Eastern artisans in search of a sturdy rug usable in a harsh environment. The traditional Persian, Indian, and Oriental rug-maker uses an age-old hand knotting method to create a rug surface that’s smooth and soft and has lasting beauty. Hand knotting allows the artist to create complex designs, without sacrificing the strength and comfort of the rug. The hand-knotting technique takes a great deal of time and mastery to perform. Therefore, most hand-knotted rugs are priced (and collected) accordingly. The Jufti knot rug is another type of the desirable hand-knotted design. The Iranian Jufti uses a variety of textured knots to create 3 dimensional effects, or flat-worked designs. 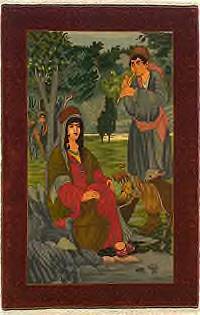 They offer a unique flavor for hand-knotted rug seekers looking for something a bit different. Some flokati rugs are also still made using the old techniques, a style that uses basic knotting with thick, tufted fur. There are also handmade braided rugs on the market, fashioned after the colorful, useful rugs made by American colonists. Using a traditional braided twist, pioneers worked scraps of cloth and cord into beautiful and functional rugs. 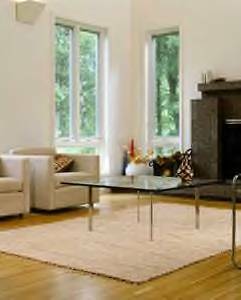 Many rug makers still use this tried-and-true braided technique, and offer handmade rugs in a braided style for the decorator who wants an authentic country look. Handmade rugs are the ultimate in functional art, usable in any home or office, with any décor. Whether you’re an investor seeking to showcase a range of timeless treasures, or if you’re adding the finishing touch to your new home, a handmade rug offers a sense of personal satisfaction and value that’s simply unbeatable. Traditional Berber rugs are unique rugs which have been painstakingly hand woven by the Beni Ourain tribes people. They are currently enjoying a surge of popularity in home decor trends. 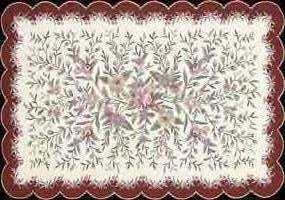 For more information about Beni Ourain rugs click here .